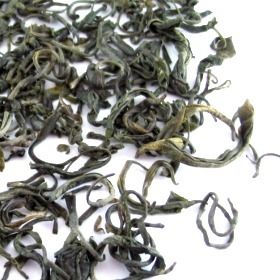 This organic Green Tea is a Mountain Green Tea which is rich in antioxidants. Prepared using only fresh young leaves from the spring harvest. We recommend this organic green tea to you if you wish to try new types of green tea. This green tea is cultivated using natures solutions for pest control and environmental protection. The resulting produce is said to provide a fuller and richer taste beside being healthier for consumption. Complex flavor, delicate sweet taste and very refreshing. The tea is made by using 1 buds and 2 leaves, which are extremely tender. They were carefully and well processed fully by hands and shaped into fine curled tea leaves that looks like J shaped leaves (like a hook). This green tea yields a pale green liquor in the cup.